A series of steep-roofed pavilions linked by gardens and external corridors make up this home by De Reus Architects on Hawaii's Big Island. 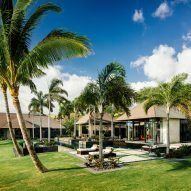 The studio designed Kauhale Kai for a client who is fond of modern art and architecture, and spent years living in Tahiti, and their extended family. 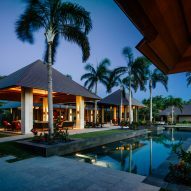 The sprawling house is located on the island's northern Kohala Coast, overlooking Kaunaoa Bay, and is based on the area's thatched-hut village settlements known as kauhale. 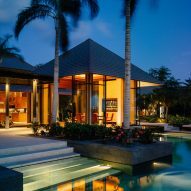 "[This] interpretation of the traditional, close-knit, Hawaiian kauhale settlement is an elevated version of the island's laid-back style, driven by restraint and understatement while designed for tropical liveability," said De Reus Architects, which has offices in Waimea and Honolulu, Hawaii, and Sun Valley, Idaho. A series of seven pavilions, all with steep hipped roofs, are organised along axes that spread from a large swimming pool in the centre of the site. 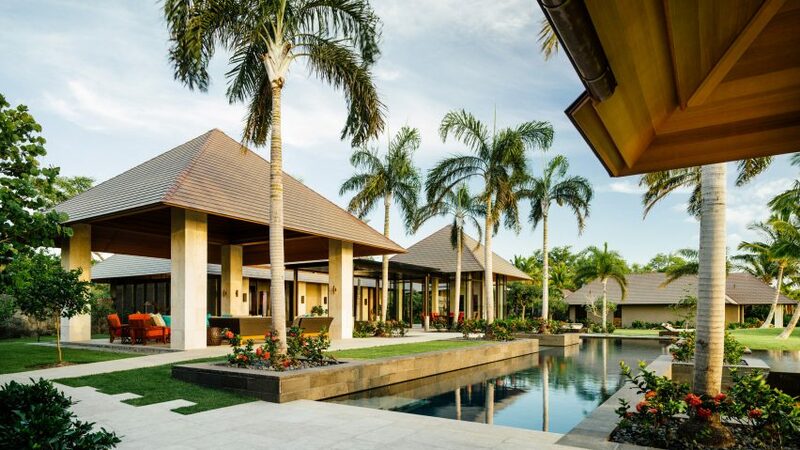 Designed in what the architects describe as a "modern tropical" style, these pavilions, or hales, together total 6,700 square feet (620 square metres) of living space. They are linked by a series of external routes, planted or walled on the sides to form corridors exposed to the elements. 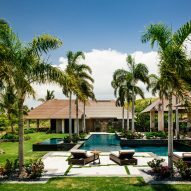 "These transitional spaces add a gracious quality to the home and provide a unifying synergy between the hale structures, tropical plantings, large-scale stone exterior elements and the site's coastal views," De Reus Archiects said. Like the small huts they are based on, each pavilion accommodates a different function. Some, like living and dining areas, have their sides open to the sea breezes. Others that house sleeping quarters are protected by floor-to-ceiling glass wrapped around their limestone columns. 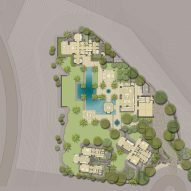 Satisfying the client's affinity for Polynesia, a stacked-stone water features sits at the main entrance and a series of monoliths are dotted between the buildings. Interiors, by Californian firm Saint Dizier Design, feature wooden columns, panelling and ceilings, with pops of colour provided by artwork and upholstery. 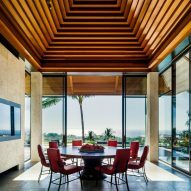 Outdoor furnishings are kept minimal so as not to distract from the palm-fringed ocean views. "Finding modernity, within this coastal community's strict traditional design guidelines, was a point of emphasis," said De Reus Archiects. 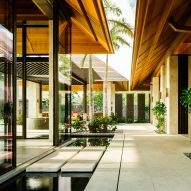 "The design team's efforts from the onset were to craft a modern sense of restraint, inspired by cultural cues from the Malayo-Polynesian cultures that had profoundly influenced the client's artistic tastes for decades." 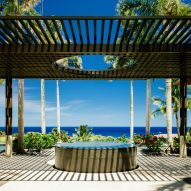 Hawaii's dramatic volcanic landscape and white sand beaches are a draw for both holiday makers and those relocating permanently, who have built houses on the largest island in the US state's chain that range from tiny wooden retreats to impressive concrete villas.